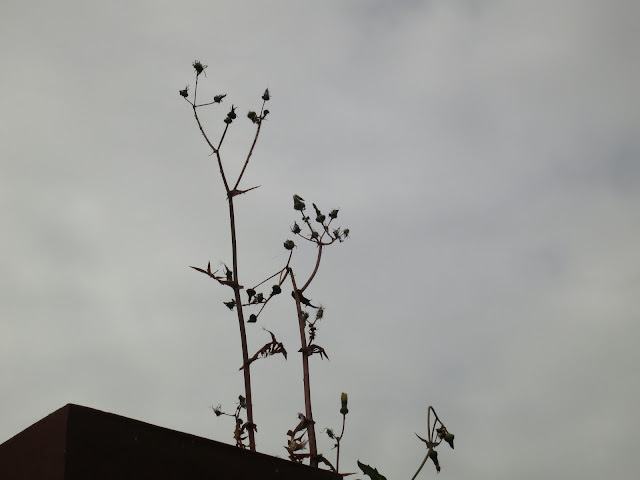 A sow thistle growing on a wall may flower and thrive. A human with no-where to go will be less successful. 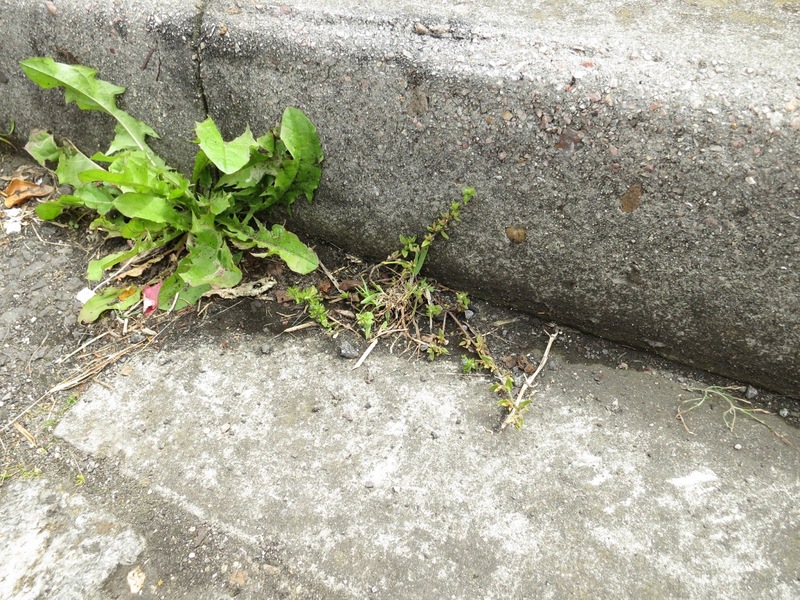 As you know - can't fail to have missed - I am impressed by street plants. They live in shop doorways and gutters and flourish there. People don't. You may also have gathered from previous posts that I visit Oxford from time to time. What I haven't said in these posts is that while photographing street plants, I've been taken aback by how many people live on pavements there too. I mean, in almost every town people sleep rough - but in Oxford, to an outsider like me, the visible numbers are shocking - so many doorways are every night turned into cramped, temporary bedrooms. still lives but is getting a bit cramped. 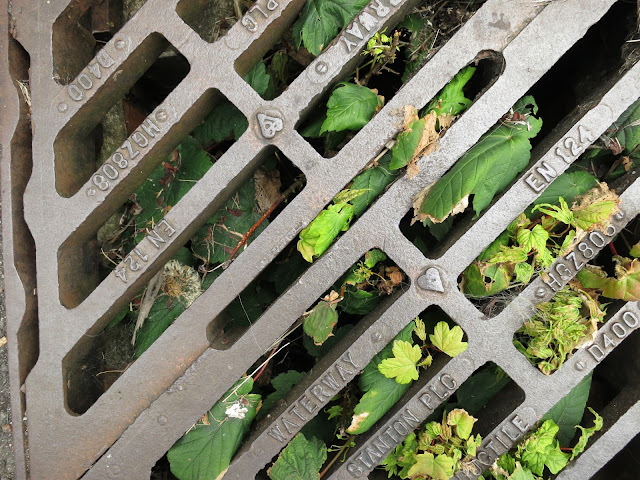 Drains are not meant for trees - nor shop doorways for humans. I don't understand. Oxford is a place with one of the best universities in the world. It's a place stodgy with outstanding brains. You'd have thought they could have set aside some time to put their intellectual heads together and work out what can be done. Meanwhile, council funding for charities working with and for homeless people in Oxford has been cut by £1.5 million this year. I don't want to go on about Oxford over much. It's just happens to be where I get most shocked. It's the place where I think about homelessness more than I do anywhere else - even more than where I live. It's the place where I think, over and over "what are minds for if not for addressing these kinds of basic needs?" And it's where (I expect you were waiting for this . . . ) where I know someone who is taking part in an event to raise a little of the money charities need to help those who are homeless, or newly homeless, or newly with a roof over their heads. Having somewhere to stay - though important - is not the end of the matter. It means a life-style change and that doesn't necessarily come easy to everyone. By clicking the link you'll go to the Just Giving page of a first-time fundraiser. She won't be the only one coming at this from scratch but she happens to be the one I know . . . And while each participant has been asked to raise £100 by being cold for a few hours . . . it would be good if every one of them were to raise more, for it's not for themselves they are doing it. And how people are rarely as resilient as they are. Photos in this post were taken in Dorset, not in Oxford. But these kinds of plants live in both places. Some other Loose and Leafy Street Plant posts. P.S. I suddenly realise it looks a bit odd, exhorting you to give when it seems (from the list) as if I haven't done so myself! But due to the nature of my card I had to use the 'anonymous' option. With my connection to Oxford (I got my degree there) I feel I should contribute, but there are just so many worthy causes that I can't support them all. We like to give larger amounts occasionally, to help with bigger issues - like the hurricane in Haiti or the earthquakes in Nepal. Not that homelessness is not a big issue, of course! Hello Mark. Not only do I understand but agree. My usual pattern of giving is to choose three charities each Christmas / New Year, give to them and refuse to give anything in between. I make exceptions, of course (for things like disasters for instance) but, on the whole, I prefer to give thoughtfully rather than randomly to whoever happens to ask. (Which is one of the reasons I'm dubious about sponsored anythings.) And this particular charity is very locally based so I expect most readers (possibly all) will want to give to organisations in the areas where they live. Another reason is to draw attention to the way cuts mean some charities are having to put a significant element of the time they would previously have put into fulfilling their proper purposes into raising money - which seems such a waste. And, finally, I genuinely often think of the parallels between street plants and street people. And of the ways some plants are thought of as flowers and others as weeds. There are human parallels there too. Bravo, great post. I just went to Portland, Oregon, and to the Chinese Gardens. But surrounding the gardens there were lots of homeless huddled in the rain. A friend who lives there said there had just been an area "cleared" and so the homeless are more visible and present, as they struggle to find a new place for their tent. In my rural area we need far more support and less discrimination and more care for both mental health and addiction.... and places to go.